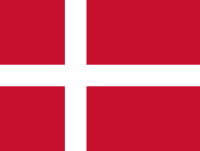 The Flag of Denmark, the Dannebrog is red with a white Scandinavian cross. It is the oldest flag in the entire world. The flag is supposed to have fallen from the sky during a battle in 1219 in Estonia. The Danes were about to lose the battle when this sign from above gave the warriors new energy, and made them win. In reality the Dannebrog of 1219 was most likely a crusade banner - the war in 1219 was a crusade against the Estonians, who were not Christians. The battle took place in the 15th of June, and every year the flags birthday is celebrated in this day. In some countries the flag is a symbol of the state. In Denmark the Dannebrog is very much a symbol of the people, and the flag is used for all kinds off private celebrations - such as birthdays, weddings and Christmas. For Danes the Dannebrog is a sign of happiness and celebration and not of patriotism. This page was last changed on 18 January 2016, at 08:16.